"One challenge I take on every year!" 7 years in a row now. I guess I kind of love this race because I keep signing up year after year. I may not have made my goal time this year but I had fun like I do every year on this course. Plenty of well lit porta potties by the start but not in the corral area like in the past. Fast and easy packet pick up at 2 local running stores and Nike store available of the course of 3 days and on site on race morning. Very convenient! Enough water stops on the course with djs and pacers had music for their pace groups. Even a water sprinkler tent set up at mile 8 to help cool down before you hit the MacArthur bridge for the 3rd bridge on the course. Shade for the last 2 miles through the marina area and part of South Point Park. Medal issue but was handled well with notifying the runners a few days before and having a temp medal and Starbucks giftcard from UPS due to shipping issue. Medals will get to us in a few weeks so I am not worried, things happen but the mishap was handled well in my opinion. Fun post race party with food options and great snacks as well as a beer garden. I will be back next year for sure for my "5" medal to complete the 3 year challenge. And FREE race photos uploaded within 24 hrs! "Cold and Rainy but still a blast!" The weather was not ideal but it helped me finish quicker. Everything was easy to find at the start/finish lines and the photo opp lines moved quickly. Got great FREE pics after the event (the same day even!) . Course is always beautiful even in the drizzly rain, post race food was abundant but did not stay for the post race entertainment. Needed to return to the car for dry clothing to prepare for Miami Marathon the next day. 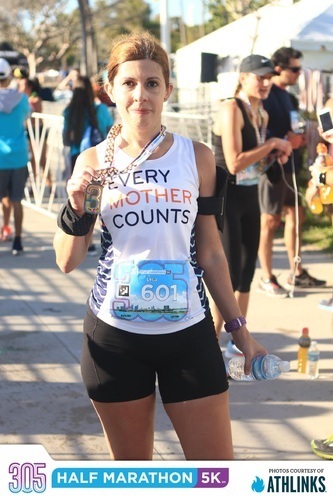 "Fun times & second fastest marathon "
I have been running the marathon/half for the past 5 years and every year things go smoother and smoother on the course. Back end of the course was flipped this year which was very good for us middle of the pack marathoners to save our eyes from the blinding sun on the causeway. Plenty of hydration on the course (I stopped at almost all the last half stations) Plenty of spectators for the first 12.5 miles and a nice calm quietness for the second half. Always love the pineapple on the course for a natural and healthy treat. Post race nutrition was great, boxed meals with an option for vegetarians (always a great surprise!) and nice photo opps at the post race party. FREE photos are also part of this race's charm as well as quickly uploaded. This is my 6th experience on this course and it has been one of my best ones! Parking was no issue as there are plenty of parking garages and they are not full at that time in the early morning. The weather was great and the views of Biscayne Bay were gorgeous on Sunday morning. I did not stop to take a pic of the views but I saw quite a few runners stopping to get them. All the pacers had mini speakers with Miami/running inspired and inspirational anthems to power you through those 5 bridges, pacers were great and on point. Also on course were other djs providing extra music, plenty of musical options to hear while running this course. 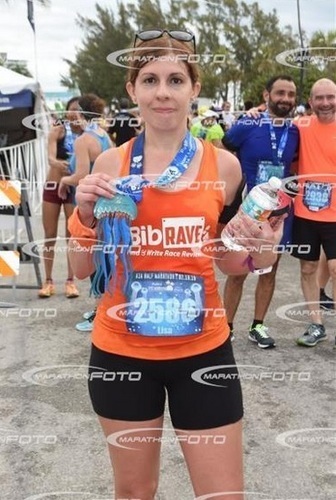 Post race had a pot and pans PR station instead of the typical PR bell at most races, very MIAMI. The post race food was croquettas/pastelitos, other Cuban desserts, very 305! Course was slightly different this year and avoiding running directly into the sun, thankfully! Beer/sangria bar post race, I did not partake in it this year but I will next year! I will definitely be signing up for the next 2 years to earn my "0" and "5" medals to complete this 3 year series race! "Sunrise over the ocean views"
The expo had tons of products to try and great deals, packet pickup was a breeze, took a total of 5 minutes to collect my bib, shirt and swag bag. Great swag bag with colvita olive oil samples, Kodiak cakes pancake mix, coffee, chocolates, bandaids, much more than other races I have done. Race day porta potties were plentiful and the race took off in waves of runners, no dark spots on the course at the beginning to stumble. Well lit course and fun run through the Birch State Park. I had never been there and now I wanna go back and check it out with my toddler. The aid stations had water, gatorade and body armour juice available, I saw some Power Bars being passed out too but didn't require them. Weather was humid but overcast clouds kept it not as hot, overall great views of the ocean with the sun rising. Post race was very well organized and lots of food options to choose from, Bubba burger was there offering veggie and turkey patties for runners, Mission had cheese quesadillas, Michelob Ultra was providing the beers. Plenty of food options, I think I even seen some mexican food available too! There was a good band playing rock music near the food options, so fun post race entertainment also.